Haydn String Quartets, Op. 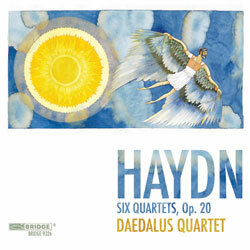 20 "Sun"
This special two-disc set features Haydn's six revolutionary Op. 20 "Sun" quartets. These quartets, composed in 1722, were among the most influential quartets of this era. Before embarking on his own first (op. 18) quartets, Beethoven studied the scores of Haydn's six masterpieces, copying them out and scoring the first quartet for string orchestra. Writing of the Daedalus's Haydn, New York Times chief music critic, Anthony Tommassini stated: "the excellent Daedauls Quartet, in residence at Columbia University, opened the season by playing Haydn's Quartet Op. 20, No. 2, one of the six "Sun" Quartets from that opus. The performance was insightful and vibrant. Hearing such an excellent, up-close performance made this Haydn piece seem even more monumental."